In our area the wintertime is connected with fun, action, excitement and adventure! Maishofen is surrounded by popular ski resorts which deeply impresses you with extensive ski-region and fully developed toboggans. Our house is because of the calm position and the short 15-minute-distance to the ski centre Saalbach-Hinterglemm a perfect starting point for all kinds of winter activities. 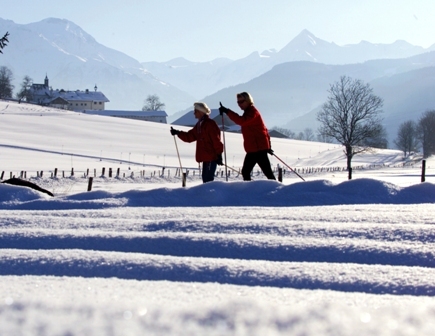 Of course the Pinzgau gives you a variety of ski centres because of Zell am See and Leogang, which are also easily reached by a short drive in a car. After having painted the town red, relaxation is near! The indoor swimming pool in Zell am See or the thermal bath in Gastein, which is about an hour away, is therefore ideally suited. You are bright-minded? Then we recommend you ski huts or pubs in the evening for making use of the Aprè Ski Après-Ski and probably making acquaintances.